Washington County Commissioner Mike Bouvier attended last Wednesday's Legislative Day at the state capitol. Once there, he met with Bartlesville Senator Julie Daniels in her new Oklahoma City office. Bouvier also met with House District 10 Representative Judd Strom. In those meetings with Daniels and Strom, Bouvier talked about the Association of County Commissioners of Oklahoma bills the commissioners would like to see approved by the House and Senate. He believes he had a good response from them in those meetings. 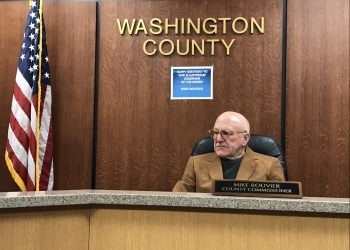 We will have more on the ACCO bills that the Washington County Commissioners have their eyes on as the 2019 legislative sessions progress.